Established in Victoria, Vancouver Island, B.C., by John Mortimer of Aberdeen, Scotland in 1877, Mortimer's Monumental Works Ltd’s proud tradition of quality craftsmanship continues today. 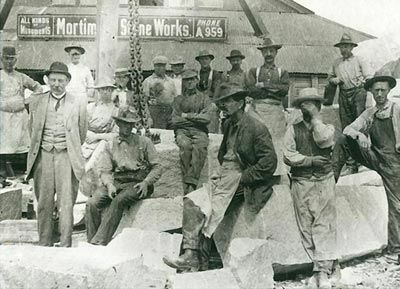 In the early years, Mortimer’s operated their own granite quarry on Pender Island, B.C. transporting the raw materials to Victoria for manufacture. Over time, Mortimer’s began to import granite from several sources around the world to provide our customers with a broader range of colours. Thankfully, technology has made the handling and finishing of granite much easier than what it was in the early 1900s as shown below, in a photo taken in Victoria around 1915. The Mann family purchased Mortimer's Monumental Works Ltd in 1977, in its 100th year. Since 1977, the business has grown from a small manufacturing company with retail sales in the Victoria area, to a sizeable business operating in Victoria and supplying and shipping monumental stone and bronze work for all of Canada and the United States. Through our network of funeral directors and agents, Mortimer's can meet the needs of customers throughout the province and further afield. We are a family owned and operated business with an excellent reputation for providing quality monuments and superior service. Our workmanship, well known in the industry, is second to none and our monuments are a remarkable and unique testament of artistic accomplishment. Our 139 years in business forms the backbone of our product guarantee. Our objective is always to serve our clientele professionally and with thoughtful care and attention to detail. This dedication to excellence is the foundation of our service and guarantee. Creating beautifully designed, long-lasting monuments is more than just a business for us. It’s our passion. This means we take extra care to create a meaningful memorial, not just a grave marker. We, Kerry Mann and the staff at Mortimer's Monumental Works Ltd, operate our business and sales office together with our manufacturing plant at 709 Kings Rd. in Victoria, British Columbia. We invite you to visit us and see firsthand the quality and craftsmanship of our products. “What a fabulous family team (even the non-family members are family). They treated our requests with complete respect, fulfilled them beyond our expectations and as a perfectionist, exceeded even my requirements for perfection. They were very busy but still managed to meet our short term urgent needs and then carried forward with our longer term beautification needs. Mom and Dad are truly represented with a beautiful site for memory. “Mortimer's did an amazing job on my son's gravestone and have been incredible to deal with. They worked patiently with me to create a beautiful memorial marker that uniquely and truly represents him. Their flexibility, professionalism and kindness was beyond my expectations and the care they took in ensuring they understood what I wanted, making it work and attention to detail was amazing. Even though we didn't have much time, I never felt rushed or pressured and everything was completed to a standard of quality that was exceptional.